Copernican heliocentrism is the name given to the astronomical model developed by Nicolaus Copernicus and published in 1543. It positioned the Sun near the center of the Universe, motionless, with Earth and the other planets rotating around it in circular paths modified by epicycles and at uniform speeds. 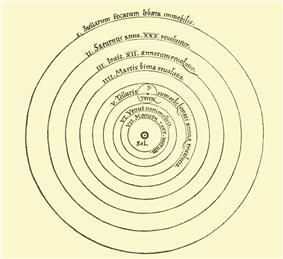 The Copernican model departed from the Ptolemaic system that prevailed in Western culture for centuries, placing Earth at the center of the Universe, and is often regarded as the launching point to modern astronomy and the Scientific Revolution. Distance from Earth to the Sun is small compared to the distance to the stars. It is notable that, according to Plutarch, a contemporary of Aristarchus accused him of impiety for "putting the Earth in motion." Ibn al-Haytham, Abu-Rayhan Biruni, Abu Said Sinjari, Najm al-Dīn al-Qazwīnī al-Kātibī, and Qutb al-Din al-Shirazi discussed astronomy and logic flaws in the Ptolemaic system, but did not propose a heliocentric system. Copernicus cited Aristarchus and Philolaus in an early manuscript of his book which survives, stating: "Philolaus believed in the mobility of the earth, and some even say that Aristarchus of Samos was of that opinion." For reasons unknown (although possibly out of reluctance to quote pre-Christian sources), he did not include this passage in the publication of his book. Inspiration came to Copernicus not from observation of the planets, but from reading two authors. In Cicero he found an account of the theory of Hicetas. Plutarch provided an account of the Pythagoreans Heraclides Ponticus, Philolaus, and Ecphantes. These authors had proposed a moving Earth, which did not, however, revolve around a central sun. 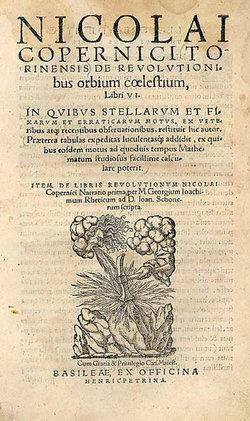 When Copernicus' book was published, it contained an unauthorized preface by the Lutheran theologian Andreas Osiander. This cleric stated that Copernicus wrote his heliocentric account of the Earth's movement as a mere mathematical hypothesis, not as an account that contained truth or even probability. Since Copernicus' hypothesis was believed to contradict the Old Testament account of the Sun's movement around the Earth (Joshua 10:12-13), this was apparently written to soften any religious backlash against the book. However, there is no evidence that Copernicus himself considered the heliocentric model as merely mathematically convenient, separate from reality. Mathematical techniques developed in the 13th-14th centuries by the Muslim astronomers, Mo'ayyeduddin Urdi, Nasir al-Din al-Tusi, and Ibn al-Shatir for geocentric models of planetary motions closely resemble some of those used later by Copernicus in his heliocentric models. This has led some scholars to argue that Copernicus must have had access to some yet to be identified work on the ideas of those earlier astronomers. However, no likely candidate for this conjectured work has yet come to light, and other scholars have argued that Copernicus could well have developed these ideas independently of the Islamic tradition. Copernicus also discusses the theories of Al-Battani and Averroes in his major work. The prevailing astronomical model of the cosmos in Europe in the 1,400 years leading up to the 16th century was that created by the Roman citizen Claudius Ptolemy in his Almagest, dating from about 150 A.D. Throughout the Middle Ages it was spoken of as the authoritative text on astronomy, although its author remained a little understood figure frequently mistaken as one of the Ptolemaic rulers of Egypt. 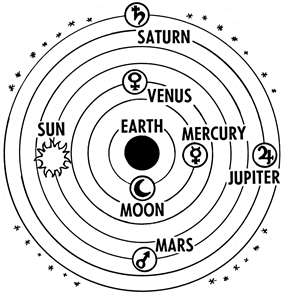 The Ptolemaic system drew on many previous theories that viewed Earth as a stationary center of the universe. Stars were embedded in a large outer sphere which rotated relatively rapidly, while the planets dwelt in smaller spheres between—a separate one for each planet. To account for apparent anomalies in this view, such as the apparent retrograde motion of the planets, a system of deferents and epicycles was used. The planet was said to revolve in a small circle (the epicycle) about a center, which itself revolved in a larger circle (the deferent) about a center on or near the Earth. A complementary theory to Ptolemy's employed homocentric spheres: the spheres within which the planets rotated could themselves rotate somewhat. This theory predated Ptolemy (it was first devised by Eudoxus of Cnidus; by the time of Copernicus it was associated with Averroes). Also popular with astronomers were variations such as eccentrics—by which the rotational axis was offset and not completely at the center. Ptolemy's unique contribution to this theory was the equant—a point about which the center of a planet's epicycle moved with uniform angular velocity, but which was offset from the center of its deferent. This violated one of the fundamental principles of Aristotelian cosmology—namely, that the motions of the planets should be explained in terms of uniform circular motion, and was considered a serious defect by many medieval astronomers. In Copernicus's day, the most up-to-date version of the Ptolemaic system was that of Peurbach (1423–1461) and Regiomontanus (1436–1476). Copernicus' major work, De revolutionibus orbium coelestium - On the Revolutions of the Celestial Spheres (first edition 1543 in Nuremberg, second edition 1566 in Basel), was published during the year of his death, though he had arrived at his theory several decades earlier. The book marks the beginning of the shift away from a geocentric (and anthropocentric) universe with the Earth at its center. Copernicus held that the Earth is another planet revolving around the fixed sun once a year, and turning on its axis once a day. But while Copernicus put the Sun at the center of the celestial spheres, he did not put it at the exact center of the universe, but near it. Copernicus' system used only uniform circular motions, correcting what was seen by many as the chief inelegance in Ptolemy's system. Heavenly motions are uniform, eternal, and circular or compounded of several circles (epicycles). The center of the universe is near the Sun. Around the Sun, in order, are Mercury, Venus, Earth and Moon, Mars, Jupiter, Saturn, and the fixed stars. The Earth has three motions: daily rotation, annual revolution, and annual tilting of its axis. Retrograde motion of the planets is explained by the Earth's motion. The distance from the Earth to the Sun is small compared to the distance to the stars. It opened with an originally anonymous preface by Andreas Osiander, a theologian friend of Copernicus, who urged that the theory, which was considered a tool that allows simpler and more accurate calculations, did not necessarily have implications outside the limited realm of astronomy. Copernicus' actual book began with a letter from his (by then deceased) friend Nikolaus von Schönberg, Cardinal Archbishop of Capua, urging Copernicus to publish his theory. Then, in a lengthy introduction, Copernicus dedicated the book to Pope Paul III, explaining his ostensible motive in writing the book as relating to the inability of earlier astronomers to agree on an adequate theory of the planets, and noting that if his system increased the accuracy of astronomical predictions it would allow the Church to develop a more accurate calendar. At that time, a reform of the Julian Calendar was considered necessary and was one of the major reasons for the Church's interest in astronomy. General vision of the heliocentric theory, and a summarized exposition of his idea of the World. Mainly theoretical, presents the principles of spherical astronomy and a list of stars (as a basis for the arguments developed in the subsequent books). Mainly dedicated to the apparent motions of the Sun and to related phenomena. Description of the Moon and its orbital motions. Concrete exposition of the new system including planetary longitude. Further concrete exposition of the new system including planetary latitude. From publication until about 1700, few astronomers were convinced by the Copernican system, though the book was relatively widely circulated (around 500 copies of the first and second editions have survived, which is a large number by the scientific standards of the time). Few of Copernicus' contemporaries were ready to concede that the Earth actually moved, although Erasmus Reinhold used Copernicus' parameters to produce the Prutenic Tables. However, these tables translated Copernicus' mathematical methods back into a geocentric system, rejecting heliocentric cosmology on physical and theological grounds. The Prutenic tables came to be preferred by Prussian and German astronomers. The degree of improved accuracy of these tables remains an open question, but their usage of Copernican ideas led to more serious consideration of a heliocentric model. However, even forty-five years after the publication of De Revolutionibus, the astronomer Tycho Brahe went so far as to construct a cosmology precisely equivalent to that of Copernicus, but with the Earth held fixed in the center of the celestial sphere instead of the Sun. It was another generation before a community of practicing astronomers appeared who accepted heliocentric cosmology. From a modern point of view, the Copernican model has a number of advantages. It accurately predicts the relative distances of the planets from the Sun, although this meant abandoning the cherished Aristotelian idea that there is no empty space between the planetary spheres. Copernicus also gave a clear account of the cause of the seasons: that the Earth's axis is not perpendicular to the plane of its orbit. In addition, Copernicus's theory provided a strikingly simple explanation for the apparent retrograde motions of the planets—namely as parallactic displacements resulting from the Earth's motion around the Sun—an important consideration in Johannes Kepler's conviction that the theory was substantially correct. Heliocenticity explained why retrograde motion happened when the earth was closest to the other planet - an observation that was treated simply as a fact in the geocentric model. However, for his contemporaries, the ideas presented by Copernicus were not markedly easier to use than the geocentric theory and did not produce more accurate predictions of planetary positions. Copernicus was aware of this and could not present any observational "proof", relying instead on arguments about what would be a more complete and elegant system. The Copernican model appeared to be contrary to common sense and to contradict the Bible. Tycho Brahe's arguments against Copernicus are illustrative of the physical, theological, and even astronomical grounds on which heliocentric cosmology was rejected. Tycho, arguably the most accomplished astronomer of his time, appreciated the elegance of the Copernican system, but objected to the idea of a moving Earth on the basis of physics, astronomy, and religion. The Aristotelian physics of the time (modern Newtonian physics was still a century away) offered no physical explanation for the motion of a massive body like Earth, but could easily explain the motion of heavenly bodies by postulating that they were made of a different sort of substance called aether that moved naturally. So Tycho said that the Copernican system “... expertly and completely circumvents all that is superfluous or discordant in the system of Ptolemy. On no point does it offend the principle of mathematics. Yet it ascribes to the Earth, that hulking, lazy body, unfit for motion, a motion as quick as that of the aethereal torches, and a triple motion at that.” Likewise, Tycho took issue with the vast distances to the stars that Copernicus had assumed in order to explain why the Earth's motion produced no visible changes in the appearance of the fixed stars (known as annual stellar parallax). Tycho had measured the apparent sizes of stars (now known to be illusory – see stellar magnitude), and used geometry to calculate that in order to both have those apparent sizes and be as far away as heliocentrism required, stars would have to be huge (the size of Earth's orbit or larger, and thus much larger than the sun). Regarding this Tycho wrote, “Deduce these things geometrically if you like, and you will see how many absurdities (not to mention others) accompany this assumption [of the motion of the earth] by inference.” He said his Tychonic system, which incorporated Copernican features into a geocentric system, “offended neither the principles of physics nor Holy Scripture”. Thus many astronomers accepted some aspects of Copernicus's theory at the expense of others. His model did have a large influence on later scientists such as Galileo and Johannes Kepler, who adopted, championed and (especially in Kepler's case) sought to improve it. However, in the years following publication of de Revolutionibus, for leading astronomers such as Erasmus Reinhold, the key attraction of Copernicus's ideas was that they reinstated the idea of uniform circular motion for the planets. Kepler introduced the idea that the orbits of the planets were elliptical rather than circular. Isaac Newton proposed universal gravity and the inverse-square law of gravitational attraction to explain Kepler's elliptical planetary orbits. In 1725, James Bradley discovered stellar aberration, an apparent annual motion of stars around small ellipses, and attributed it to the finite speed of light and the motion of Earth in its orbit around the Sun. In 1838, Friedrich Bessel made the first successful measurements of annual parallax for the star 61 Cygni, of 0.314 arcseconds; which indicated that the star was 10.3 ly away, close to the currently accepted value of 11.4 ly. He narrowly beat Friedrich Georg Wilhelm Struve and Thomas Henderson, who measured the parallaxes of Vega and Alpha Centauri in the same year. Whether Copernicus' propositions were "revolutionary" or "conservative" was a topic of debate in the late twentieth century. Thomas Kuhn argued that Copernicus only transferred "some properties to the Sun's many astronomical functions previously attributed to the earth." Other historians have since argued that Kuhn underestimated what was "revolutionary" about Copernicus' work, and emphasized the difficulty Copernicus would have had in putting forward a new astronomical theory relying alone on simplicity in geometry, given that he had no experimental evidence. In his book The Sleepwalkers: A History of Man's Changing Vision of the Universe, Arthur Koestler puts Copernicus in a different light to what many authors seem to suggest, portraying him as a coward who was reluctant to publish his work due to a crippling fear of ridicule. ^ Heath (1913), p. 302. ^ Especially the Tusi couple, and models for the motions of Mercury and the Moon. ^ Goddu (2010, pp.261–69, 476–86), Huff (2010, pp.263–64), di Bono (1995), Veselovsky (1973). ^ Blair, Ann (1990). "Tycho Brahe's critique of Copernicus and the Copernican system". Journal of the History of Ideas 51 (3): 355–377 [p. 364]. ^ Hirschfeld, Alan (2001). Parallax:The Race to Measure the Cosmos. New York: Henry Holt. Crowe, Michael J. (2001). Theories of the World from Antiquity to the Copernican Revolution. Mineola, New York: Dover Publications, Inc.
di Bono, Mario (1995). "Copernicus, Amico, Fracastoro and Ṭūsï's Device: Observations on the Use and Transmission of a Model". Journal for the History of Astronomy xxvi: 133–54. Drake, Stillman (1970). Galileo Studies. Ann Arbor: The University of Michigan Press. Esposito, John L. (1999). The Oxford history of Islam. Oxford University Press. Goddu, André (2010). Copernicus and the Aristotelian tradition. Leiden, Netherlands: Brill. Linton, Christopher M. (2004). From Eudoxus to Einstein—A History of Mathematical Astronomy. Cambridge: Cambridge University Press. McCluskey, S. C. (1998). Astronomies and Cultures in Early Medieval Europe. Cambridge: CUP. Raju, C. K. (2007). Cultural foundations of mathematics: the nature of mathematical proof and the transmission of the calculus from India to Europe in the 16th c. CE. Pearson Education India. Veselovsky, I.N. (1973). "Copernicus and Naṣīr al-Dīn al-Ṭūsī". Journal for the History of Astronomy iv: 128–30. Hannam, James (2007). "Deconstructing Copernicus". Medieval Science and Philosophy. Retrieved 2007-08-17. Analyses the varieties of argument used by Copernicus in De revolutionibus. Goldstone, Lawrence (2010). The Astronomer: A Novel of Suspense. New York: Walker and Company.